While navigating a tumultuous stock market and a rapidly evolving MTG market, I often find parallels between the two worth sharing. While sometimes not directly applicable, strategies from one economy can educate us on how we should consider the other. This is perhaps my favorite part about writing for this site – the freedom I have to explore the similarities between the two in an academic way. However not everything between the two matches up perfectly. Sometimes a mindset that is commonly applied in the stock market doesn’t make sense to consider in MTG finance. This week I will write about another paralleled question between Wall Street and MTG finance. You’ll notice along the way that the questions don’t fit 100%, but they still trigger worthwhile discussion that leads to an actionable recommendation. Through this framework I believe we can make some deterministic conclusions around what the best pick-ups are going forward as we enter 2016. The premise: it’s all about winners vs. losers. Allow me to explain. One of my favorite podcasts (besides Brainstorm Brewery of course) is the port of the television show Fast Money. The CNBC show is all about traders and their reactions to the constant fluctuations and news of the stock market. They do a nice job keeping things entertaining – although I’ll admit the traders, while “famous”, make their fair share of errors. I never follow their direction blindly. But I do like the way they pose up questions and analyses. One question they consider frequently that I really enjoy is whether or not one should look to buy the “winner” or “loser” of a given segment. For example, they may touch on retail stocks and discuss whether one should buy a beaten up stock such as that of Macy’s or a recent winner like Nike. In a nutshell, they’re addressing whether they feel it’s better to ride the momentum of the winner or bet on a catch-up play from the loser. The question is certainly worth considering seriously. By definition the losing stock, such as Macy’s, is certainly out of favor on Wall Street. 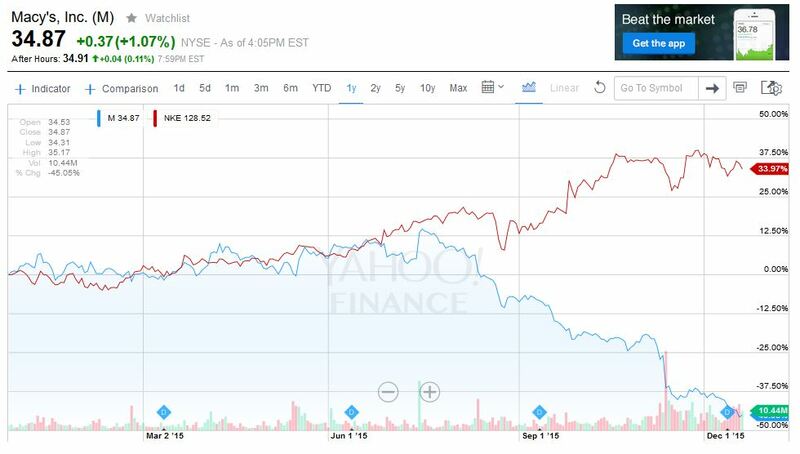 Meanwhile Nike is basically the darling of the Dow, having the best 2015 performance of the 30 stock index. However as long as the “loser” is still profitable, at some point it may become an attractive enough value to pick up. Conversely the winner may be getting too expensive, facing resistance to the upside. Now let’s try to apply this to Magic finance. 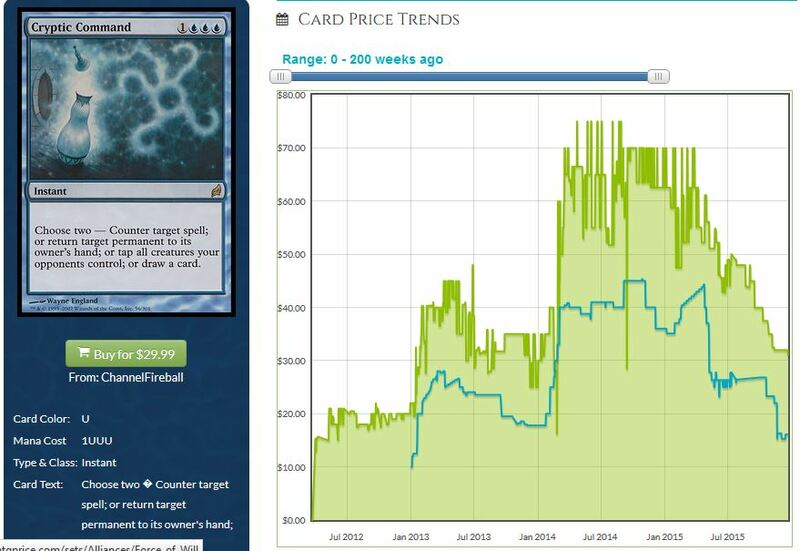 Random buyouts aside, prices rise and decay in MTG due strictly to supply and demand. There really isn’t as strong of an equivalent of “in-favor” and “out-of-favor” like there is in the stock market. There’s far less emotional selling and buying (not zero, but certainly less). Macy’s is certainly hated right now and Nike is a hedge fund’s dream. W can’t necessarily draw this parallel to, say, Khans fetches and Zendikar fetches perfectly. But we can try. Over the past few months, Scalding Tarn has spiked, pulled back, and then continued its rise. 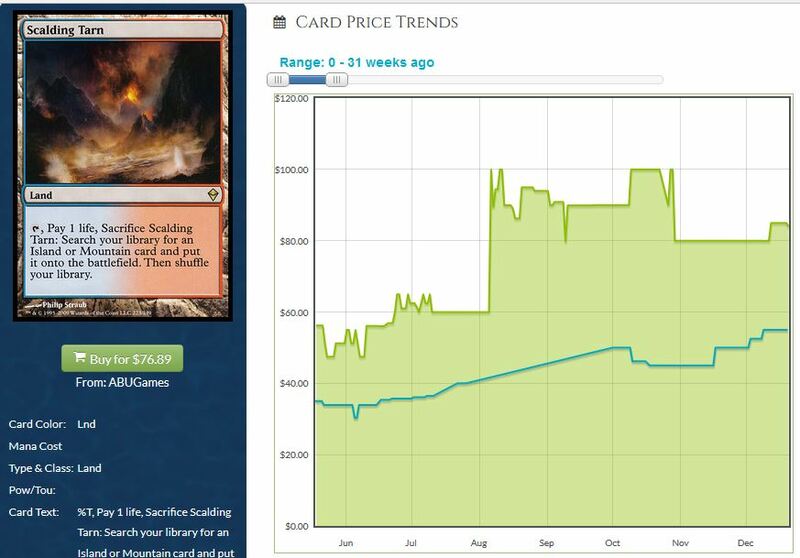 More importantly, buylists on the Zendikar fetches has consistently risen for the most part. On the other hand vendors are paying less on Polluted Delta now than they were over the summer. You could say Khans fetches aren’t in favor right now while their Zendikar counterparts certainly are. These trends are driven purely by fundamentals. There isn’t any excessive emotional momentum at play here – Standard players are moving their Khans fetches in anticipation of rotation and this volume is outweighing Modern and Legacy demand, where as Zendikar fetches aren’t facing that same pressure. It’s as simple as that. If asked which is the better pickup, I’d argue both will ultimately trend together once Khans is well out of Standard. Until then, the play is to stick with the “winner” – not because of momentum, but because Scalding Tarn and Verdant Catacombs will particularly experience greater demand as we enter 2016 while Khans fetches continue to suffer from rotation. Occasionally, a publicly traded company will announce a secondary offering. This is essentially the creation of more stock to raise cash. The practice dilutes value of current shareholders by increasing the supply in the market. In a way, it’s kind of the equivalent of a reprint. Except often times a company offers more shares to raise capital for a given investment, which is intended to pay out in the long term. Reprints in Magic offer zero long term benefit. Because of this difference, a winner/loser comparison involving reprints is again not a perfect parallel with the stock market. But I can still use the setup of winner versus loser to provide guidance on where I think the market goes from here. For example, let’s compare the relative “winner” Force of Will with a reprinted Modern counterpart, Cryptic Command. Force of will has shown cyclical behavior over the past few years, but the general direction is upward. Cryptic Command on the other hand, spiked in Spring 2014 but has since pulled back drastically due to the Modern Masters 2015 reprint. Once again, this isn’t an emotional reaction in price – the supply of Cryptic has increased significantly, impacting fundamentals. If I assume supply will remain constant going forward (i.e. no more reprints), my recommendation is to follow the option with more demand upside in the future: Cryptic Command. Modern is growing in popularity and has the Pro Tour season to support demand. On the other hand, Legacy demand may falter as there are fewer premier Legacy tournaments in 2016 than recent years. While the cyclical nature of Force of Will may suggest there’s upside in the next 3 months, I can’t imagine the growth is significant enough to merit a material investment. I’d much prefer getting into Cryptic Command, betting on the next Modern surge. 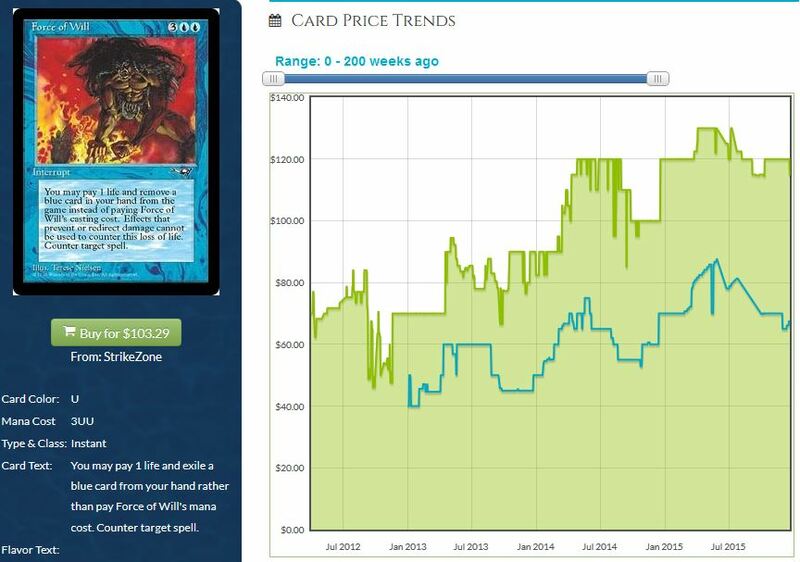 It also helps that we have data on other Modern Masters reprints that have since recovered in price. Perhaps the most difficult winner/loser comparison lies in the one-drop discard spell category. Which is the better pickup: Inquisition of Kozilek (winner) or Thoughtseize (loser)? Looking at the charts above, we see that the top buy price of Inquisition has risen from $3 to nearly $8 throughout 2015. 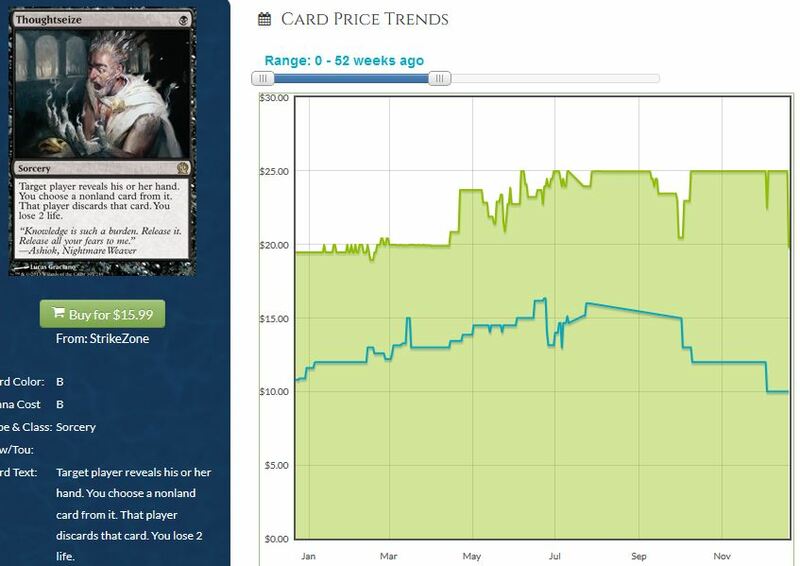 Meanwhile the top buy price of Theros Thoughtseize has decreased from around $11 to $10 after hitting a peak over the summer. The fact that these two discard spells are nearing parity in price is baffling given their discrepancy in rarity and (supposed) power level. While it’s fair to ask the question of which is the better pickup, once again we have a situation where prices are driven strictly by fundamentals. The supply of Thoughtseize is higher than that of Inquisition despite the rarity difference. This is due to the recent printing of Thoughtseize in the high print-run set Theros. On the other hand Inquisition of Kozilek was opened far less being a third set from years ago. Once again this isn’t a love/hate comparison like Macy’s and Nike – this isn’t about emotions. Still, the question begs an answer. If I was forced to choose, I’d have to ask for another month to decide. Why a month? Because I want to see what gets printed in Oath of the Gatewatch first. With the recent Kozilek spoiler, a reprint of Inquisition of Kozilek makes tremendous sense. I simply cannot advocate picking up copies of this discard spell until we confirm it is not getting reprinted. Assuming it dodges reprint again, I’d recommend Inquisition. Until then, the safer pickup is Thoughtseize. Momentum is a term that’s thrown around often on Wall Street. A stock that has done well over recent months is considered to be “in-favor”, sometimes leading to continued upward movement. On the other hand a hated stock can sometimes get beat up unfairly simply because of its recent poor performance. Macy’s and Nike are two stocks that reflect this dichotomy. Another good example would be the Facebook/Twitter pair. The former is incredibly well-run and has the dedicated support from Wall Street. The latter has struggled to grow its user base, and therefore it has been an absolute dog of the Nasdaq. 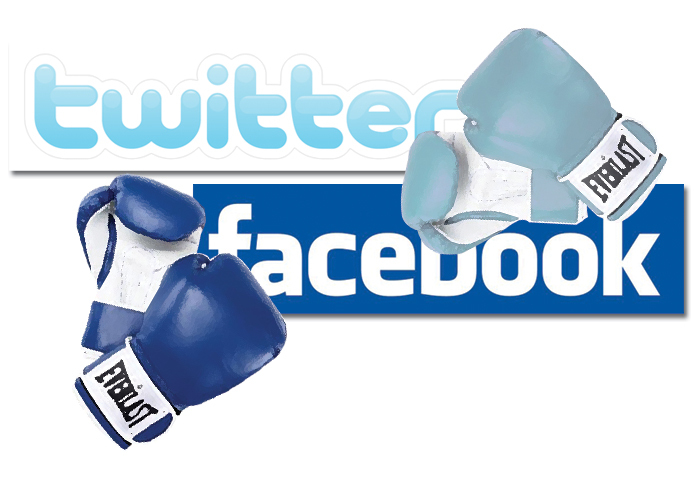 With each passing day, Facebook seemingly climbs higher while Twitter gets beaten up, perhaps unfairly, even more and more. The same comparisons can be made in the Magic market. 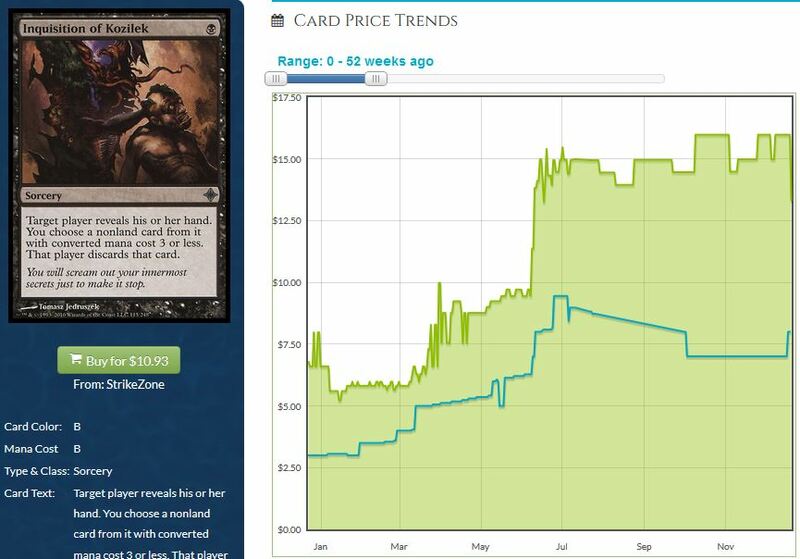 However, buyouts aside MTG cards don’t really exhibit emotional “momentum” in the same fashion. Typically price movements happen due to fundamental shifts in supply and demand. Still, the winner/loser debate is one that is certainly applicable to MTG finance. The choices really are boundless: Wasteland (loser) or Dark Depths (winner)? Jace, the Mind Sculptor (loser) or Liliana of the Veil (winner)? Dark Confidant (loser) or Stoneforge Mystic (winner)? Each choice presents two options: either bet on a card that’s already moved up significantly or bet on a card that is seeing fundamental decay in price. Perhaps looking at these comparisons can help us conclude a broader opinion of the market. For example, my predisposition to choose Zendikar fetches over Khans fetches and Inquisition of Kozilek (barring reprint) over Thoughtseize is an indicator that I prefer Modern cards printed at least a couple years ago over recently printed cards. But my pick of Cryptic Command over Force of will indicates my belief in Modern’s future success over that of Legacy. Such broadening conclusions can really help dictate one’s ongoing investment strategy. In fact, that’s essentially what I’ve done here. By starting with some individual questions, I’ve boiled down my investment strategy going forward. I’m going to target Modern cards over Legacy cards and older cards over newer. While perhaps not so clear cut, these guiding principles will ensure I think more mechanically about my options before committing funds in a directionless fashion. If nothing else, this winner/loser exercise has helped me this much. I’d recommend considering these comparisons and using your own answers to drive broader investment strategies. Perhaps you’ll surprise yourself with where you end up. If nothing else, you’ll think more diligently about the many investment decisions we face on a daily basis. Just remember – in MTG finance prices don’t move on momentum (besides buyouts). 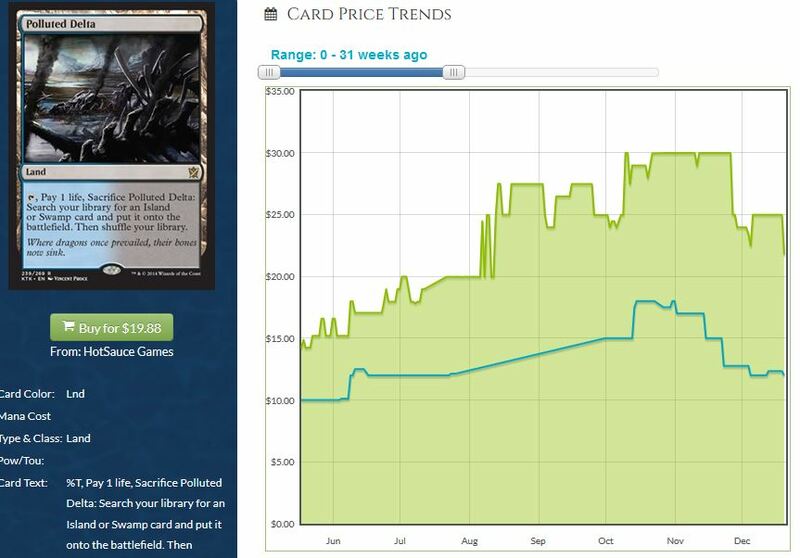 Card prices rise and decay due to shifts in supply and demand. Wasteland isn’t down in price because it’s simply hated – it is genuinely in less demand relative to six months ago. So when picking losers, be cognizant of the evolving metagame and format favorability. We all like an underdog, but picking one with the right risk/reward equation will be the best way to bank on these out-of-style cards throughout 2016. Arabian Nights Erhnam Djinn has just hit an all-time high thanks to demand for the Old School MTG format. Star City Games has recently increased their price of NM copies to $69.99, and they only have 2 MP copies in stock with a price tag of $49.99. I’m surprised by two things here. First, the fact that their Near Mint price tag is substantially below TCG Player – this is likely to change. Second, their Moderately Played price is 70% of their Near Mint price. This suggests to me that the demand is indeed from ‘93/’94 players and not collectors, who would generally be willing to pay a much larger premium for NM copies over MP copies. It’s really interesting to see which printings of Birds of Paradise have gone up in price lately. A cursory look through Star City Games’ stock can give us a peek into which editions are most in-demand recently. They are out of stock of Tenth Edition copies ($6.45), NM Revised copies ($6.65), NM Fourth Edition copies ($6.99), NM Ravnica copies ($6.99), and Unlimited copies ($69.99). They also have low stock in most other sets. It would appear that the lack of reprint in Origins didn’t matter – this one-drop is still rising in price. Chaos Orb is almost completely sold out on the internet. Chalk this up to demand from collector’s along with Old School MTG players. Star City Games is completely sold out of the card across each printing, with Unlimited’s price tag currently at $149.99. I fully expect them to increase their prices on all three printings…if they can ever get some back in stock again, that is. This is by far the most fun to read article the site has produced in nearly two months (not to mention nearly the only one without some snarky self congratulatory commentary) I appreciate the correlations you’ve made to other financial markets and the thought process you’ve laid put to consider these investments. What are your thoughts on old school sealed product moving forward? I recently accomplished turning my PucaPoints into Arabian nights, Antiquities and Legends sealed booster packs which I feel won’t be quite as susceptible to the ebb and flow of the market. Agreeing with Brock. It’s nice to see a good set of reasoning and analysis without the sarcastic/braggart stuff. Excellent work Sig. Thanks zeroflame for your support! The support really means a lot to me. In a world where there’s so much discussion around Standard and mainstream cards, I enjoy looking at some of the more obscure areas in MTG Finance to find ideas. I strive for stability in a portfolio, and finding targets that are solid buy-and-holds for months to years are most attractive to me these days. I’m really encouraged to hear there are others in the same boat! Old School sealed product, eh?? That’s not a question I’ve been asked before. Typically people are hesitant to pick up older booster packs because packs from back then were easily searched under a bright light. Are you confident the packs you acquired aren’t searched? Even if they are searched, they’re nice collector’s items. But I wouldn’t invest in older sealed product with the hope of opening good contents. These are strictly collector’s items at this point, and would appreciate in value accordingly. I don’t think the Old School market will be a factor here. But you’re certainly right that downside is minimal as well. Just don’t open them :). Thanks again, look forward to continuing the dialogue with you! Very brave. You have to almost assume that any older boosters have been searched. It’s so damn easy to do it. Just be careful you don’t invest too much into loose boosters – you don’t know their history. I would always assume searched. But collectors still like having old sealed boosters just to collect. That’s the main driver of the market, so understand that you’re banking on increased demand from that niche group. They had Arabian’s Erhnam Djinns? Dangit… wish I would have seen it earlier, would have bought them. They had a couple. I’m guessing based on your comment, they’re gone? Lol. Sorry about that – I should have known they wouldn’t have lingered…their price was below TCG Player so it should have been obvious to me. Well, keep an eye on it I suppose…chances are these are climbing higher since they’re a mainstay in Old School. Best of luck to you in finding some affordable copies! I own pretty ugly HP ones myself – I don’t need them to look pretty, I just need them to be sleeve playable :). Lol, because his comment is more likely to cause people to by than your article? Re-reading, probably misunderstood what you were saying, ignore the previous comment. DON’T SPECULATE ON OLD SCHOOL CARDS PLEASE! If you want to get into the format it will only get more expensive over time, so I’d recommend getting in now. But I don’t recommend buying up quantities of older cards for speculative purposes. It’ll lead to an unsustainable bubble that will leave sour tastes in everyone’s mouth. “I’m guessing based on your comment, they’re gone” -> I read that as a suggestion that his comment had caused it. I didn’t have my dose of caffeine yet. In my defense, that sentence could be structured to be more clear ;). But yeah, obviously that’s not what you would be meaning with it. I don’t drink coffee, but I was indeed referring to your earlier statement on Twitter. Thanks for the thoughtful response. I am definitely NOT going to open then lol. I decided, as you mentioned, that these are the investment themselves. I am quite confident that they haven’t been searched. A good deal isn’t just getting a lot for a little- it’s also about confidence in your trading partner and their integrity; this is why I have been working hard to establish good working relationships with certain Pucatraders and then working to create longer term trade deals for things off the beaten path. Again thank you for the excellent article! Maybe a future Topic can be on some type of market analysis on the best stuff to hold sealed and how you think the pricing will trend. Good call on keeping them sealed. Also, I like your thought process behind establishing connections and lasting relationships. To me this is part of the fun of MTG Finance – just getting to know others and learning about how other approach the hobby. By talking frequently with a core group of friends, I have learned about some successful strategies. Sealed product is a tricky one. I’ve written on the subject many times in the past and I used to have a sizable investment in sealed boxes. But I’ve fallen out of love with the endeavor – a quick look at what Return to Ravnica booster boxes have done price-wise in 2015 reflects why. I thought that this set, filled with Modern gems like shocks and Abrupt Decay, was certain to climb higher in price. But it hasn’t. In fact boxes are now near their all time lows on eBay. With extremely large print runs in new sets, it became a lot trickier to find solid sealed product investments. The further we get from their release the harder it is to prove providence of sealed product. Even if your Pucatrade partners are absolutely reliable somebody in the chain from the original purchaser of the pack to you may have been less honest. Just saying that I would certainly inspect the packs for traces of searching.